My books get translated into foreign languages and I get a few copies when they do. Other than the one copy I put on my bookshelf to go “How cool is that?” they sit in a box. I’d like to find them homes (and I know a lot of other authors are in the same position). Do you work in a library that serves a non-English community and could use more books in foreign languages? Do you work or volunteer in a nursing home or convalescent facility where there’s a need for books in other languages for the residents to enjoy? Maybe your church or community center runs a program for immigrants or non-native speakers? Surely someone somewhere would benefit from these books. Not only am I willing to donate books where they’ll be useful, I’ll collect the information in to one place and make it available to other authors as well so that they can find good homes for their foreign editions. I may not have the languages you need, but there’s an author out there who does. Look at all those books up there… brand-new and unread. That’s a sad state for a book to be in. Let’s find them someone. Please feel free to share this post on your social networking sites. Once again, I’ve teamed up with Lynn Raye Harris and Kira Sinclair in a book of excerpts to whet your appetite for our upcoming books. This time, we’re also excited to welcome debut Desire author Andrea Laurence to the booklet. 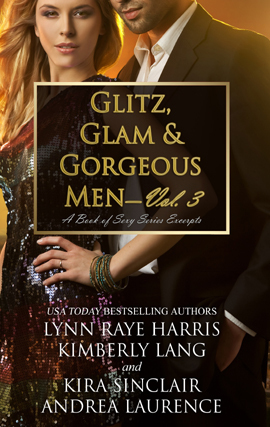 Andrea’s books are full of glitz and glam and gorgeous men, so she’s a good fit. 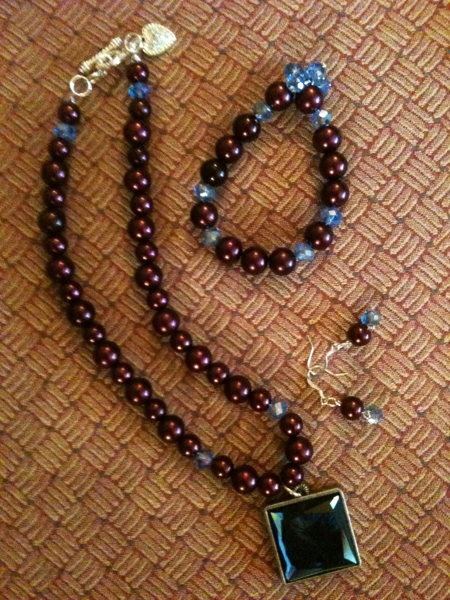 *Design by Croco Designs. (Who also designed this website). She’s a genius! I get a lot of hits from people looking for free downloads of my books. Let me just say that there are no free LEGAL copies of my books available. Oh, there are ILLEGAL copies of my books out there. I spend time I’d rather spend writing sending takedown notices because the people uploading these books are violating copyright and I’m just trying to protect the books I worked hard to create. Of course, piracy hurts us financially. I make a royalty on each copy sold. Therefore, an illegal download means I didn’t make any money off that sale. I love writing books. It’s my job, however, and I use that money to pay my bills. If writers don’t get paid for the books they create, they have to find other ways to pay their bills. Piracy hurts readers because when writers have to take other jobs to pay their bills, they don’t have the same amount of time to write the books readers enjoy. Piracy also hurts authors because our publishers like us to prove that we’re worth the money they’re spending editing, designing covers and printing/distributing books. If we don’t sell books, we don’t get new contracts to write more books because we’re not providing a return on their investment. The thousand illegal downloads doesn’t prove to the publisher that people like our books. The publisher looks only at the books sold because that’s how they make money. Low sales equal an author who doesn’t have a publisher anymore. That hurts readers, too. If you’ve ever wondered why an author set out to write a trilogy but only two books exist, it’s because the sales of those first two books weren’t considered good enough for the publisher to take on the third book. Piracy is illegal. Copyright laws exist to protect the intellectual and creative property of artists of all kinds. The pirates who upload books, music, movies, software, etc to sites so others can download them for free are breaking the law and showing disrespect for the creators of that content. The people who download that content are stealing. It’s no different than walking into a store, shoving something down your pants and walking out. It’s theft. Period. Some folks believe that all content should be free, and I’ll never be able to convince them otherwise. They’ll never pay for anything, no matter how many times they’re told it’s illegal and immoral to steal. However, if you believe that authors deserve to be paid for the work they create, I’m hoping you’ll go purchase their books. I know; times are tough right now and lots of people are hurting financially. However, the library is a great place to get books you love to read for free. And it’s legal. I’m hoping you just landed on this page because you were hoping there was a free, legal giveaway going on somewhere or maybe you were hoping the next book was available already. I now hope that you’ll wait and get a copy legally — either through a bookstore or your local library. Harlequin/Mills and Boon controls all of the rights to the distribution of books written for Presents/Presents EXTRA/KISS and Modern/Modern Heat/RIVA/Tempted. Free downloads of selected Harlequin/Mills and Boon titles are available through the Harlequin and Mills and Boon websites, but none of my books are currently available, though. Sorry. Harlequin has made several of my books available through the Scribd subscription plan, but once again, those are not free. 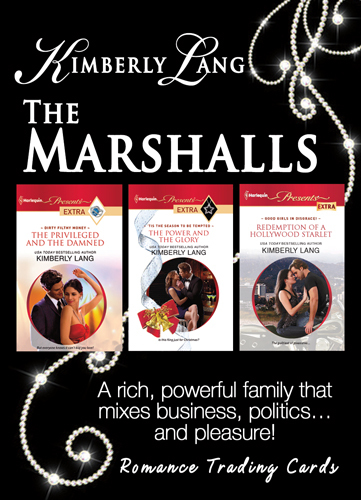 Entangled Publishing controls the rights for “Grace Felt the Heat” and When Honey Got Married… No free legal copies of that book are available. Penguin Random House (NAL) controls the rights for the Magnolia Beach series of books. Reviewers *may* be able to find Advance copies of new books through NetGalley for review purposes. Reviewers can also contact the publishers directly to request review copies. Any other site offering free downloads of my books are doing so illegally. 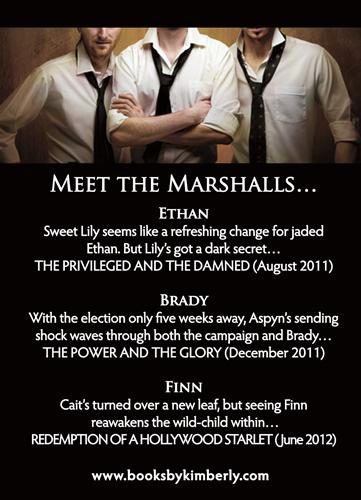 I have new a Romance Trading Card for the Marshall series! I’ll have them at the various places I’ll be over the spring and summer (at least while they last!) If you’d like one, just send me an SASE and I’ll send it to you! I have a cover for Redemption of a Hollywood Starlet! That guy is really pretty. Hummina is the word that comes to mind. And he’s absolutely perfect for Finn! Redemption will be out in the UK in April and in June in the US. Tickets for Barbara Vey’s luncheon on sale! 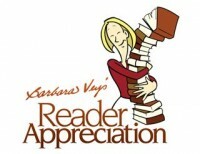 I’m so thrilled that Barbara Vey has asked me to be a part of her first Readers’ Luncheon. Barbara is a huge advocate for the genre and a really neat lady. This luncheon sounds like it’s going to be awesome, and I hope if you’re in the Milwaukee area, you’ll be able to attend on Tuesday, April 10.